And on the final day of the #EverySimpsonsEver marathon, I finally wrote something about The Simpsons. The Simpsons have to be one of the most generous families in TV history. They’ve opened their doors to so many people — friends, enemies, strangers, celebrities, various animals — that it became a meta-joke on the show back in the show’s eighth season, when Roy shows up, unannounced and unexplained and mostly unidentified, living with the family. 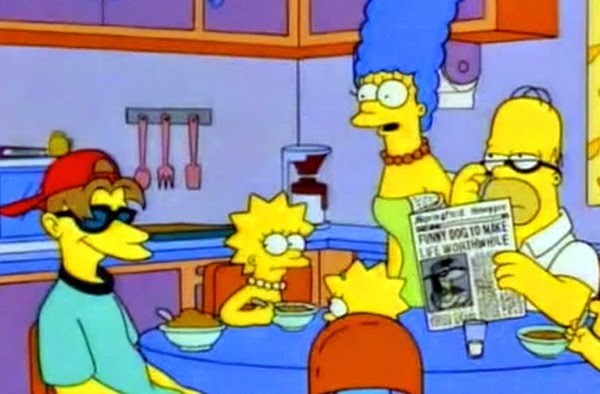 Sure, it’s a Poochie joke, but it’s also a riff on the fact that even so early into the show’s run, the “someone comes to stay with the Simpsons” plot had been done and re-done. Double meta. I didn’t watch all of the FXX Simpsons marathon. (Who could have? Who but the richest and poorest and most obsessive among us could have?) But I did have the TV for twelve days straight, and passing through the room I saw a lot of the “someone comes to stay with the Simpsons” episodes, and I started to wonder how many times the show had done this. Here, then, is every instance I could find of the Simpsons having someone to live with them. In a lot of cases, it forms the episode’s main plot, but I also included the episodes where it’s incidental to the plot. I’m sure I missed some. What say you, internet? What omissions can you point out? What clarifications can you request? What kind of idiot am I for having confused some point about the episode you hold most dear and it’s basically the best episode of the show and why don’t I know anything? I'm watching the episode "Diggs" (Episode 12, Season 25) and the Simpsons take care of Diggs' falcon, so if you're counting animals then that's another one. Wasn't Mr. Burns living with the Simpsons back in the episode where Marge paints his portrait?